Now that the weather is getting better, are you looking for some good games to get children active in the playground? These games will get children moving and will help to develop PE skills and teamwork. 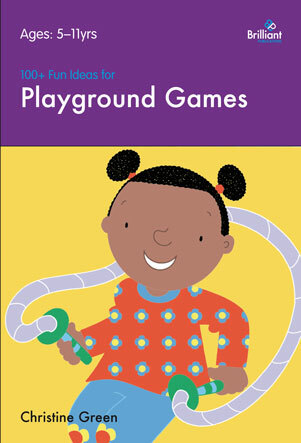 They have been taken from 100+ Fun Ideas for Playground Games. This is an ideal game for very young children to play. Chalk out two round circles on the playground approximately 15 metres apart. One pupil is chosen to be Mother Hen who must stand in between the two circles. The remainder of the class are then divided into two groups, one team standing in each of the two designated circles. When Mother Hen shouts ‘Come Home Chickens’ each group have to swop locations while Mother Hen has to try and catch as many ‘Chickens’ as she can. Whoever is caught must then remain and help Mother Hen. The last chicken caught gets to be the next Mother Hen. Be aware this is a noisy game and so should preferably be played on a large open field well away from the rest of the school. Everyone lines up alongside one another at one end of the field, and as the teacher shouts ‘Now’ each child takes a big breath and screams as loud as they are able, whilst running towards the opposite side of the field. It may sound easy but the trick is that they can only run for as long as they can scream, so when they run out of breath they must stop. Whoever runs the farthest is the winner. The ideal rope game, which can be played indoors or outdoors. Place the rope in a straight line on the ground. The aim of each player is to try to walk the straight line, holding out their arms to balance as they walk. It may sound easy but requires a lot of concentration and if they should lose balance at any point then they are out of the game, whoever reaches the end without falling is the winner. This is a fun game to play for all ages. Simply divide the class into groups and supply each one with a rope. Give them three minutes to make up a fun figure using the rope and then see who can guess what each others shape is supposed to be. The basic aim is for each child to individually throw the ball up into the air as high as they can throw. The teacher records the time before it reaches the ground. Whichever pupil throws the highest (their ball stays up the longest) is the winner. Note: Make sure to choose the area wisely and well away from school windows. Ask the children to get together in groups of three or four. Give them a list of items you wish to collect. The winners are the first group to collect all the items on your list. This is another version of the popular game Tag in which one person is still ‘it’ but when they touch someone, then whoever it was must immediately stand still. The only way they can be freed is if someone crawls between their legs. The game continues until all the players are standing in statues and the last person to be tagged is ‘it’ for the following game. Most schools have hula-hoops in their PE store and this is the ideal game for children to get them out, have fun and get fit at the same time. When the teacher announces ‘go’ the players simply hula hoop as long as they can and the winner is the one who manages to keep the hoop spinning the longest. But if they touch it at anytime with their hands or if the hoop drops then they are out of the game. The children stand in a circle several metres apart. The idea is that the ball is passed between the pupils until it is dropped. As soon as the ball starts being passed around the circle the children begin counting from 10 down to 0 and the last person to have touched the ball at ‘0’ becomes the donkey. Depending on the time-scale allow each person two/three lives. The game continues until there is only one person remaining who is the winner. A super challenging team game. Divide the class into two teams but try not to make it boys against girls. A long piece of rope is stretched out across a chalked dividing line on the playground. After the count of three the teacher gives the signal and both teams start pulling towards their direction. Whichever team manages to pull the other team over to their side are the clear winners. For more ideas for games to play outdoors with children get Christine Green’s 100+ Fun Ideas for Playground Games. What makes gold medals? A positive growth mindset! Did you know that when Adam Peaty was 14 years old, he was swimming in the slow lane with 10-year old girls? Through a huge amount of hard work, resilience and sacrifice (and good coaching) he’s gone on to win Gold at the Olympics. Or how about British boxer Lawrence Okolie? He was bullied at school for being overweight. But watching the Olympics in 2012 was life-changing for him. He was so inspired by Anthony Joshua winning an Gold medal, he quit his job in a fast food restaurant and started training to be a boxer. Just four years later he is in Rio representing Great Britain. I, for one, hope we hear many more stories, like those of Adam Peaty and Lawrence Okolie. Does your sports day include the same games every year? Are you in need of some new ideas? Try these easy-to-follow activities that require minimal equipment. Tests show we all remember 20% of what we hear, 70% of what we see and 90% of what we do. It follows that to enhance learning, we all need to get doing. Using a whole body approach to learning languages really works.